NASA will host a two-day event for 80 of its social media followers on ­­­­­­Sunday, Feb. 10, and Monday, Feb. 11, at Vandenberg Air Force Base in Lompoc, Calif., for the launch of the Landsat Data Continuity Mission, a satellite that continues a record-breaking 40 years of Earth observations. Landsat satellites provide the longest continuous global record of the Earth’s surface – ever. The first Landsat satellite launched from Vandenberg in 1972 and now what will become the eighth satellite in the Landsat series is scheduled to also launch from Vandenberg. 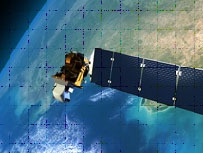 This satellite, the Landsat Data Continuity Mission (LDCM), continues Landsat’s critical role in monitoring, understanding and managing our resources of food, water and forests. A collaboration between NASA and the U.S. Geological Survey (USGS), the Landsat program provides data that shows the impact of human society on the planet – a crucial measure as our population surpasses seven billion people. Landsat data has, over time, led to the improvement of human and biodiversity health, energy and water management, urban planning, disaster recovery and agriculture monitoring, all resulting in incalculable benefits to the U.S. and world economy. LDCM will join the aging Landsat 5 and Landsat 7 satellites in orbit to produce stunning images of Earth’s surface along with a wealth of scientific data. Hear first-hand accounts by the Landsat Mission science and engineering teams. A rare look inside the the Western Range Operational Control Center (WROCC), which provides safe control of all launches from Vandenberg. The WROCC includes the control center, mission flight control center, weather center and transportation control center. Vandenberg’s on-base private museum, located at historic Space Launch Complex-10. This visit includes historic briefings and artifacts dating to the earliest launches from the West Coast. Meet fellow space enthusiasts who are active on social media. Meet members of NASA’s social media team. Registration opens on this page at noon EDT on Wednesday, Dec. 12, 2012 and closes at noon, EST on Wednesday, Jan. 2, 2013.